I use a pair of Wharfedale Denton 80th Anniversary speakers and I think they sound really good. Very easy on the ear and are very smooth across the audio band. Good value and they look nice too. @freediver Haven't looked into the Quad before. Is that even enough to power the Excite X14's? The benefit of coaxial really shows itself in nearfield. As a reference, measure the distance between the tweeter and woofer (center to center), you should be roughly 3x that distance in order for the drivers to combine cohesively. Another benefit of cow is for near-field is in regards to vertical off-axis performance; regular bookshelves would need to be angled perflectly to hit your ears (and only in one sitting position, sitting straight up and slouching would sound different) or you would need stands that bring them all the way up to ear level (which is unlikely and also leases to different performance when sitting upright and slouching). @freesole:YES,plenty of power..I am running Harbeth M30.1's with the Quad in a medium size treated room & it's heavenly...As long as you don't listen at headbanging levels or try to fill a BIG room you will get only beautifully voiced music..
I’m using Alessis Monitor One for my desktop setup. Classe SSP25 pre and Classe 25 amp. Whole setup cost me $1550 total. Sounds amazing. Denton 80th! Rival my Paradigm Studio 60 v4! Yamaha near field monitors like HS5 are great and well below your budget max. I have the Quad S2, and at $1000/pr, imho, they are a steal. I use them as computer speakers, and sit about 2-3 feet away from them. They can be bi-wired/bi-amped, too. Neat Iota is just what the doctor ordered. All of the above are good choices, you will have to go and listen to them yourself. Without a doubt & without hesitation, Burchart S400's. I have then sitting on an 88" Gladiator butcher block workbench in my audio room.. That is just about perfect for stereo imaging and no subwoofer, its not necessary. I am using Prism Sound Callia (DAC) and PS Studio M700's. Reason for that is they are 4-ohm speakers but you would not know it seeing how they are being feed 700watts i think.. There is only 1 pair of speaker terminals so obviously you cannot bi-amp or else i would.. Mads Burchart, who is owner operator of Burchart Audio in Denmark and he is quick to respond to your emails although you have to figure in the time difference. If they are out of the color or product you want he will knock some off for the wait.. I am very pleased with the speakers and i ordered them without listening to them..
How far away do you sit from your S400's? Mine would be fairly close to me, in a 9' x 8' office. I am definitely intrigued though and would power it with either my PS Audio Sprout100 for now or my Anthem MRX510. In your situation I would go for powered speakers. Anything mentioned above is a worthy choice but since your space is confined why bother with an amp at all ? With your budget you can get some top of the line near filed powered speakers from the likes of Genelec, Neumann, Adam, Focal, Dynaudio. No worries about amp up to the task or potential upgrades, less cables, less space overall IMO better SQ. All of the ones I mentioned are common for Pro applications and there must be a reason for that. Each have their own character, they all tend to the analytic, more so the Genelec, less so the Dyns. all of them well within your budget. @jbmac75 @stevecham intrigued by the Denton suggestion. I looked them up. Only $499 at MD which is far below my budget. Not a bad thing. Have you compared them against the LS50? Edifier powered speakers, like the R1700s (bought a pair for my daughter and when I finally heard them I was amazed)...about 150 bucks, and they sound astonishingly good to my cynical audio perfectionist ears, and seem very well made. My prior post should reference my Paradigm Studio 20 v4. Sorry. I am actually quite impressed with the quality and sound these Dentons deliver. Never tried any KEF (yet). KEF LSX. Just great sound and no clutter. KEF LS50 are too big. @chiptech10 Will see if that is the case when I get the LS50W next week. If it is, I may consider the LSX then. People do seem to be very impressed by them. Another option to consider if the KEF's are too big. Well under your budget and takes the amps out of the equation also. Connect one of the "small" streamers like the Node 2 or Aries Mini or even a Chromecast Audio and you are good to go. "I can power the speakers with either a PS Audio Sprout100, Anthem MRX510 or something I may buy in the future." You might want to sit tight for just a bit. In the near future PS Audio is going to be coming out with a "Sprout speaker." I have been curious myself. @genez Yeah I follow PS Audio's instagram and they have shown the enclosure for their smallest floor stander as well. Very interested in what they are going to come out with but should we be a little cautious that they are new to the speaker game? Paul McGowan used to be a part of Genesis Speaker company. Arnie Nudell and him were close friends. Arnie was the one who designed the giant famous Infinity IRS speaker system that the editor of Absolute Sound loved. Paul understands speaker construction very well... Personally, I have my eye on this Sprout Speaker and am considering them when they come out. I use Revel's M106 monitors. The previous model to the M106's are the Revel M22's which also sound very accurate. How much room will there be on this desk from the corners and rear wall? You’re going to get potentially huge (distorting) bass gain from most speakers designed to be free standing. A safer choice might be sealed box or at least front-ported speakers, which will be less affected by this positioning. Maybe something like the ATC SCM7 if you have a beefy amp. I had a pair of Totem dream catchers that I wish I would have kept for just that. Revel M105 would be much better than the M106. 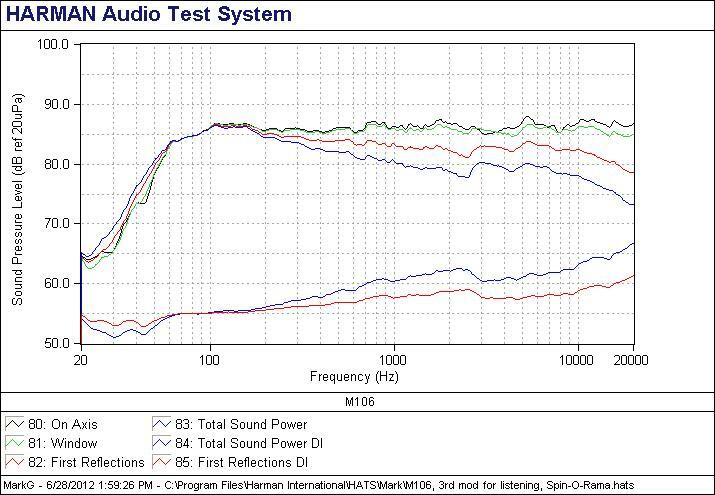 Both use a 2.3KHz crossover point, but the M105 is a 5" woofer whereas the M106 is a 6.5" woofer. 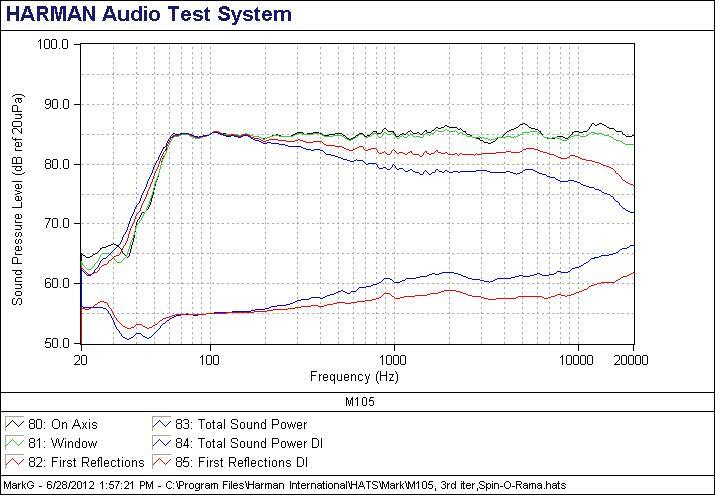 To get the same directivity as a 5" woofer with a 2.3KHz crossover the 6.5" would need to be crossed over around 1.5KHz! My Harbeth P3ESR in my workstation are about 4' from the ears, and imaging, dynamics, musicality are sensational. If you go active, try Equator D5.